All Westerners should be alarmed at recent election results in one of the world's most powerful economies - Brazil. The new president of Brazil, Dilma Roussseff is even more radical than her marxist predecessor and can in no way be seen as any sort of ally by Western governments - except perhaps the Obama Administration. 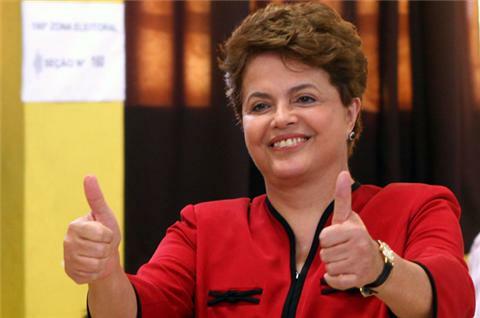 Dilma Rousseff was born in Rio de Janeiro, Brazil in 1947. Her mother was a schoolteacher and her father a political exile from Bulgaria where he had been active with the Communist Party. 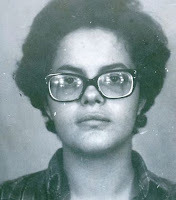 During her high school years, Dilma became influenced by the writings of French political theorist Régis Debray and by a teacher and future comrade who taught her Marxism. In 1967 she joined a radical faction of the Brazilian Socialist Party. Rousseff’ faction of the Brazilian Socialist Party, Política Operária (Worker’s Politics), split and they became part of a group that favored armed struggle against the dictatorship. It soon joined with other Marxist, anti-government militant groups to form COLINA. During this time Rousseff instructed her comrades on Marxist theory and wrote for an underground newspaper. In 1967, the small COLINA group that Rousseff, then aged 19, was a member of in Belo Horizonte, carried out bank robberies, car thefts and a couple of bombings. In January 1969, the police invaded COLINA's house and the militants responded by using a machine gun, which killed two policemen and wounded another. Dilma went underground, later participating in the formation of the Revolutionary Armed Vanguard Palmares. After that group split , Dilma was sent to Sao Paolo, where she was charged with guarding the groups weapons - which she hid under her bed. Rousseff later ended up in the clandestine Palmares Armed Revolutionary Vanguard. In the 1960s and 1970s, members of such organizations seized foreign diplomats for ransom: a U.S. ambassador was swapped for a dozen political prisoners; a German ambassador was exchanged for 40 militants; a Swiss envoy swapped for 70. They also shot alleged U.S. torture experts sent to train the generals’ death squads. Around the time she became involved with COLINA, Rousseff met and fell in love with a man named Cláudio Galeno Linhares, an older comrade-in-arms. After a year of dating, the couple married. When police broke up their guerrilla faction, the couple parted ways, with Rousseff leaving for Rio de Janeiro where she would soon meet Carlos Araújo who also had been imprisoned as a militant. The two became lovers. Rousseff was labeled one of Brazil's most wanted and beautiful fugitives. After three years underground, At the age of nineteen she was captured in 1970 by Brazil’s military police, in a “sting” operation and was considered a big enough catch that a military prosecutor labeled her the “Joan of Arc” of the guerrilla movement. She was submitted to several weeks of brutal torture while held in the Tiradentes prison. Charged with subversion by the right-wing military government, she suffered through the disappearance and torture of her Marxist companions, some of whom died or were killed by the military. Rousseff was held in prison for three years, being released in 1972. The government forbade her to engage in political activities. However, as a fighter for Brazil’s left-wing guerrilla movement in 1969, she exchanged a wedding dress for fatigues and remained in the underground. Following her release, Rousseff moved to Porto Alegre, where Araújo was from and where he was imprisoned until 1974. Rousseff returned to studying economics, graduating in 1977. In 1976, she gave birth to her only child, Paula Rousseff Araújo. Around this time, her former husband Galeno returned from political exile, and with his new partner, lived in the same house as Araújo and Rousseff. Rousseff lost her first job because of her subversive past and returned to university to pursue a master’s degree. In the early 1980s, as the generals loosened their grip on the country, Rousseff and Araújo became active in the Democratic Labour Party of Brazil (PDT), led by Leonel Brizola, brother-in-law of João Goulart, overthrown in the 1964 coup. The PDT won elections and Rousseff held a series of jobs as an adviser and bureaucrat at the local and state level. In 1993, the state governor of Rio Grande do Sul appointed her Energy secretary. She left that post the next year, as well as her relationship with Araújo after discovering another woman was pregnant with his child. They reconciled two years later but broke up again in 2000. When PDT leader, Leonel Brizola, pressed members of the party who were ministers in the state government to step down, Rousseff left the PDT and in 2001 joined the Workers' Party of Brazil, led by pro-Cuban Marxist Lula da Silva. Rousseff temporarily left her government position in 2002 to work on Lula’s successful campaign for president. Once in office as president of Brazil, he named her minister of Mines and Energy. Then in 2005, Rousseff took on the role of Lula's chief of staff. It was around this time that speculation began that Rousseff would be Lula's choice to succeed him as president. In 2009, Rousseff was diagnosed with lymphoma, and subsequently treated with chemotherapy which was successful. When her campaign for presidency kicked off in February 2009, the campaign presented her as the one to continue Lula’s largely market friendly policies and social welfare programs. She told voters that she was "going to follow Lula’s path." In March 2009, following a meeting with Barack Obama in the United States, Obama promptly asked his campaign strategists to reject a request by Brazil’s Social Democrats (PSDB) and to instead advise Dilma’s campaign. The significance of this move cannot be overstated. president Obama used his authority to transfer Democratic Party support from a comparatively moderate, leftist party, to a full blown ally of the Communist Party of Brazil. Lula's Workers’ Party, which includes major communist and Trotskyist factions, has been openly allied to the Communist Party since 1989. Communist Party of Brazil members have held posts in the “Lula” Government since 2003. Although Rousseff had little name recognition or experience as a candidate, she enjoyed a smooth ride to presidency. Then-president Lula da Silva used his 80-percent approval ratings to campaign incessantly for Rousseff, his former chief-of-staff and political protégé. In March 2010, the Communist Party of Brazil endorsed Dilma Rousseff’s candidacy. Rousseff breezed into power with 56% of the vote to 44% for Jose Serra of the centrist Social Democratic Party of Brazil, and the candidate of a right-center coalition. The Communist Party USA predictably, welcomed Rousseff's victory, almost as enthusiastically as they welcomed their "friend" Barack Obama in 2008. The American communists stated that Rousseff's election would result in Latin American economies becoming "less dependent on their relationships with the United States." The revolutionary governments of Cuba, Venezuela, Bolivia and Ecuador also welcomed the new president. At least Barack Obama now has one reliable ally in Latin America. what are the ties to Soros?? the evil man who is putting all these commies into place? Yes - the connection to Soros, oil and Iran. gosh we need to pull all of our troops back and fast. we're going to need them in this hemisphere. The PC "Night Before Christmas"
"JP Morgan Silver Manipulation Explained"